Nick Cross always listens to the voice in his head. Because if he doesn’t? Things can go really, really wrong. Like the day he decided to go off script and saved a girl from being run over . . . and let another one drown. Trying to change the future doesn’t work. But this summer at the Jersey Shore, something’s about to happen that Nick never could have predicted. 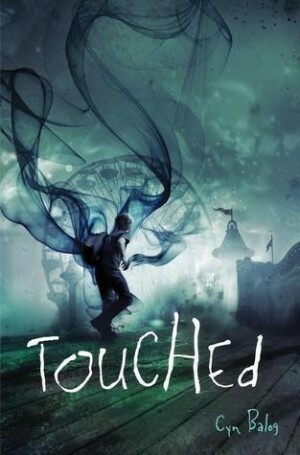 He meets a girl named Taryn and finds out about the Book of Touch. Now the path that he thought he was on begins to shift . . . and there’s no way to stop things from happening. Or is there? In a life where there are no surprises, nothing has prepared Nick for what he’s about to discover–or the choice he will be forced to make. . . . I'm not going to lie I bought this book because I thought the cover was awesome. Sure, it sounded interesting but the cover was what drew me to it. The beginning of the book was really good, really interesting. A guy that can see his own future, pretty cool. But then I started to feel bad for him because seeing your own future isn't as great as it sounds. Anytime Nick strayed away from his script his future was changed instantly. He described it as the butterfly effect and it pretty much was. Meeting Taryn ruined everything for him, at first. Until he fell for her, of course. I did think their "love" was weird. They didn't even seem to like each other but yet they were so in love. That bothered me, Nick spent more time pushing her away than being with her but he loved her apparently. She was the same way. I liked that he found out where he got his "touch" from. Which is the ability to see his future. At the same time, it made me feel bad for his mom. I loved his Nan, though. She was a great character that sacrificed everything to save her family. The ending threw me at first. I didn't know what was going on but once I figured it out I loved it. I think the ending made up for all of the things that I didn't like throughout the book.